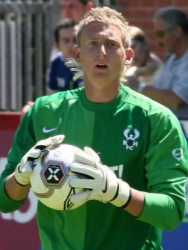 The Harriers reserve keeper, Steve Taylor, became the only player to leave under his own volition this season after he turned down a new contract with the club in favour of seeking first team football elsewhere. 21yr old Taylor joined the club during last close season from local side AFC Telford and played in six friendlies before sitting on the bench for the majority of the season as understudy to Scott Bevan. He finally got his big chance when Bevan got injured prior to an away game against Oxford Utd in mid March. In that game Steve played his full part in a stunning win for the Harriers, a game won by an equally stunning goal from Simon Russell. He remained in the side for the next five games when Bevan made his comeback. His second stint in the side came just a month later when he stood in for Bev once more after the big man picked up a red card against Morecambe and missed the final two games of the season. No doubt he was disappointed to miss out on a chance to play at Wembley instead of Bevan and this could be one of the reasons why he has decided against continuing his career with the Aggborough outfit. It's not known what Steve's plans are for the future but he's good enough to play at this level in the future but one feels that he may be forced to look lower down the League ladder for a regular first team place.